Photograph by Mohini Ufeli for GirlsCoding. Lord, today we celebrate GirlsCoding, a free program run by the Pearls Africa Foundation that seeks to educate and excite girls about computer programming. We are thankful that this group has helped more than 400 disadvantaged girls gain technical skills and confidence since 2012. 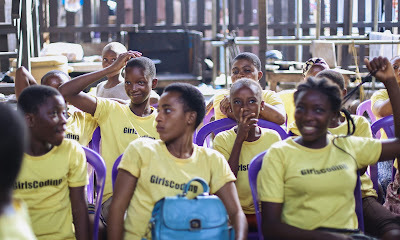 We ask your blessing on computer programmer Abisoye Ajayi-Akinfolarin as she leads this program, having given up her own successful career in the industry to help other girls escape poverty. Heavenly Father, we are thankful that these girls, having escaped Boko Haram or dealing with the challenging circumstances of slum or orphanage living, are learning practical skills that will help them break the cycle of poverty and fill jobs in a growing industry. We also delight in how their ability to see the needs of others has led to tech projects that address poverty in practical ways, combat female genital mutilation, and more. We pray for a bright future for GirlsCoding and significant impact with Nigeria and beyond. In Jesus’ name we pray, amen.